I have mostly enjoyed Dever’s writings. I often fall short of agreeing with things regarding worship styles and polity, but I like his forthrightness. I want to find good books on evangelism for church and class. This book falls into the same percentage of like and dislike on my part. I liked that it is short enough for people to read (119 pages with appendix) and done in an easy style. 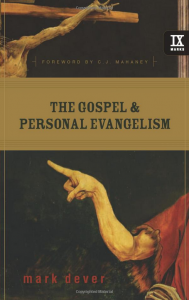 The chapter subjects are well chosen and appropriate (“Why don’t we evangelize;” “Who should evangelize? ;” and “How should we evangelize”). The down side for me is Dever’s Reformed Calvinism that pops up too often. When he says that Jesus died “for the sins of all those who would ever turn and trust him,” does he mean a limited atonement? I couldn’t prove that he doesn’t. In the last two chapters he tries to use this doctrine in a positive way and for that I am appreciative. Basically, however, he says we must wait for the elect to be regenerated so that they can be saved (at a time when the soulwinner is probably not aware that it has happened anyway). These differences do not always hinder our evangelism but they can be an unnecessary distraction in a book on personal evangelism.